Providien has been a world-leading thermoformer of highly aesthetic, complex medical device enclosures and other plastic products for over 40 years. These decades of experience have helped to make Providien a trusted and competent source for your company’s twin sheet thermoforming needs. What is Twin Sheet Thermoforming? In the twin sheet thermoforming process, two separate sheets of material are heated simultaneously. One sheet is drawn into a top tool and the other sheet is drawn into a bottom tool using a vacuum process. The tools are then brought together and pinched around the perimeter of the part. Forced air is applied between the sheets, pressing each sheet into its respective tool resulting in a hollow part that is structurally rigid and cosmetic on both sides. Parts that need to be controlled and/or cosmetic on both sides are ideal candidates for this process. 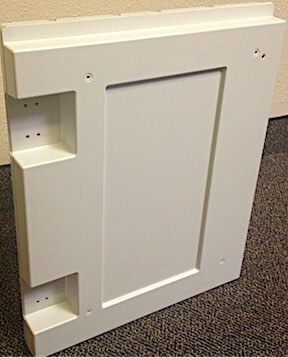 Doors, panels, and lids are great examples of these types of parts. An additional benefit of is that they dampen noise and due to the trapped air cavity; can act as a thermal insulator. Twin sheet thermoforming has significant advantages over competitive plastic processes and single-walled parts. 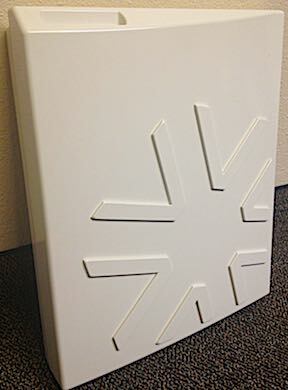 Variety of material choice – including Acrylic/PVC, PC/ABS, ABS, HIPS among others. This process can be used to manufacture a number of different types of products, some of which may include foam-filled products, single or dual-colored products, multi-textured products, air ducting, wiring ducting, hollow-formed products, and products with varying degrees of thickness. Providien uses Kydex® T which is a proprietary PVC/acrylic thermoplastic sheet that is fire retardant ABS/PVC (FR-ABS) formulations but with significantly better strength and extensibility. Many specialty grades are available for specific applications. For example, low and high temperatures, high stiffness etc. Because Kydex® T is less hygroscopic, it doesn’t require pre-drying, it’s more uniform forming with less wall thinning, offers significantly greater resistance to corrosive chemicals, and is more impact resistant, and it is available in a wide range of aesthetic choices and is UL recognized Std 94 V-0/5v. If you’re an engineer speccing thermoformed parts, here’s a little of what you need to know about our materials and tolerances. Formed details at ±.020" up to 12" plus .001 INCH/INCH above 12"
Drilled hole centers at ±.015" up to 12" plus .001 INCH/INCH above 12"
Drilled hole diameters at ±.005"
Trim dimensions at ±.015" up to 12" plus .001 INCH/INCH above 12"
If you’re a buyer, the following is a case study to help you determine if our twin sheet thermoforming process might be an option for your manufacturing needs. A Top 3 Pharma / Diagnostics Company came to Providien for manufacturing and cosmetic Improvement of a 16 Piece cover assembly transferred from a former supplier. There were multiple parts that were redesigned as part of the transfer. Cost Savings: This redesign yielded BOM savings sufficient for <12-month capital payback and 27% overall cost savings to the customer. Subsequent programs were launched leveraging Providien’s design approach which resulted in substantial cost reductions compared to prior platforms through the elimination of secondary operations. The photos on this page are examples of twin sheet formed parts produced by us for the medical industry. Please contact us to review your specific needs. Providien’s method of thermoforming offers a wide range of benefits for producing a vast number of types of products for companies. Our long history of producing plastic products in this way means a quality product for your company every time. Contact Providien today to learn how we can fulfill all your company’s twin sheet thermoforming needs. Articulating arm for a cosmetic surgery medical device. Providien Medical and other manufacturers in the plastics industry regularly use the terms “thermoforming” and “forming” synonymously. Thermoforming of plastic materials is the same as plastic forming.